On May 25 to 27 Dr. Anton Tikhomirov, President of the Novosaratovka Theological Seminary, led a seminar dedicated to the context of Martin Luther and the Reformation. Again and again he surprised his listeners with a view of these events that went beyond the typical, superficial explanations that are heard more commonly. 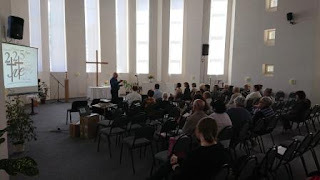 Participants were able to attend not only from Saratov, but also from congregations in Ulyanovsk, Kazan, Balakov, Marx and from the Saratov oblast. During the rest of his visit Anton together with area dean Andrey Dzhamgarov visited various congregations and sites around the Saratov region, including congregations in Marx and Zorkino. All the while Anton continued to answer questions put to him by those whom he met, and he was able to explain in an accessible way the nuances of a Lutheran worldview.